A couple of weeks ago, I shared my spring living room decorating with you (you can read it here), so you’ve already had a peek at my bookshelves from that post. 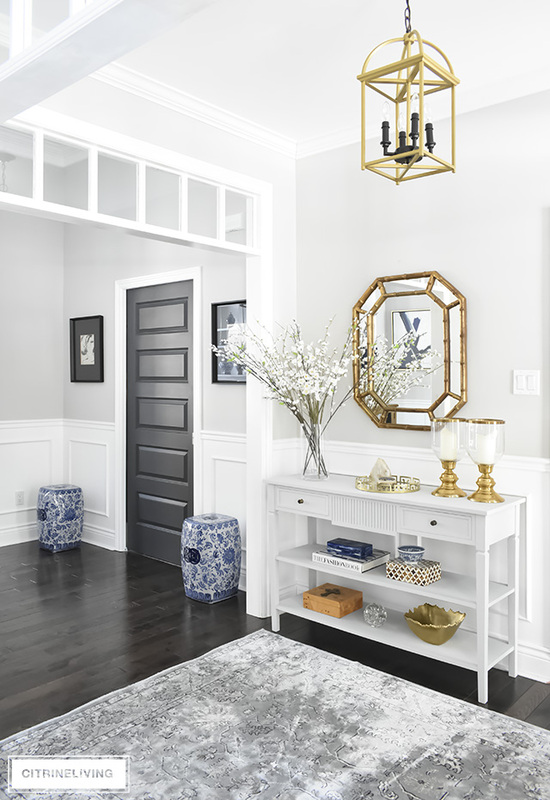 Today, I’m giving you a little bit of a closer look, and I will be walking you through how to decorate bookshelves with my simple tips that you can use to beautify your home this spring. 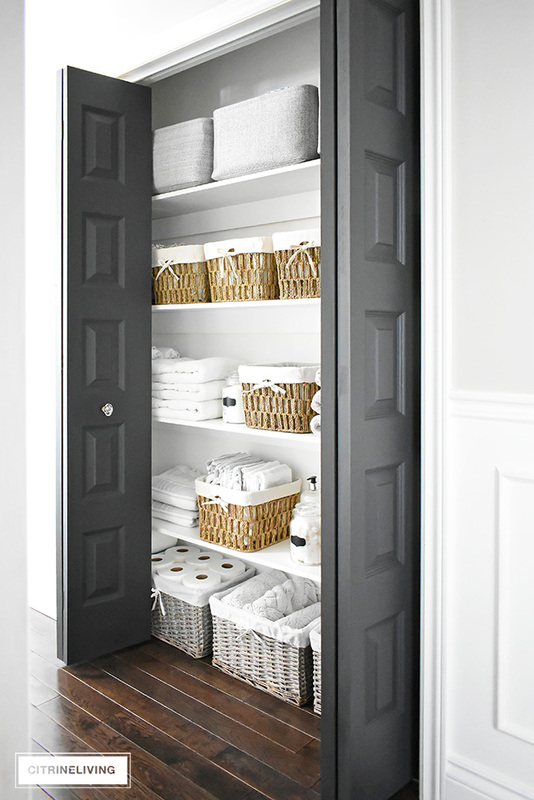 Styling shelves can be a daunting task, and honestly, there are no exact rules to follow! 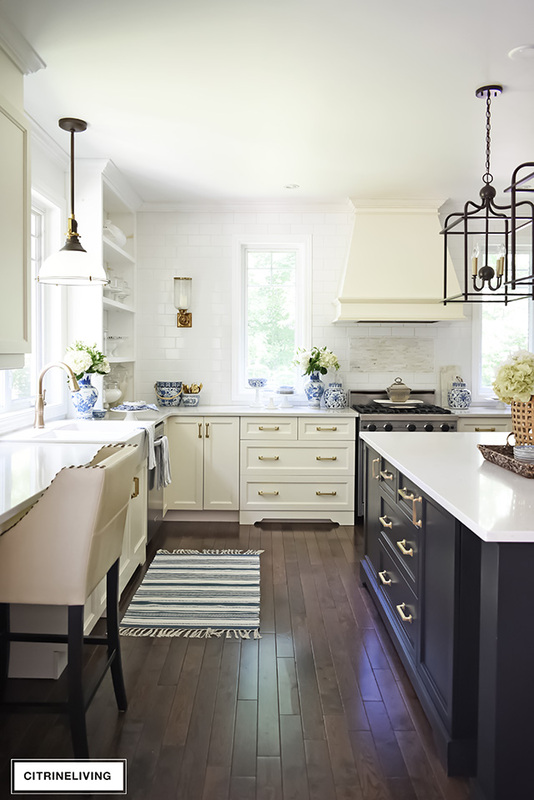 Everyone has their own approach to decorating and styling, whether it’s clean, streamlined and minimal, completely full of the things you love, or, somewhere in between. 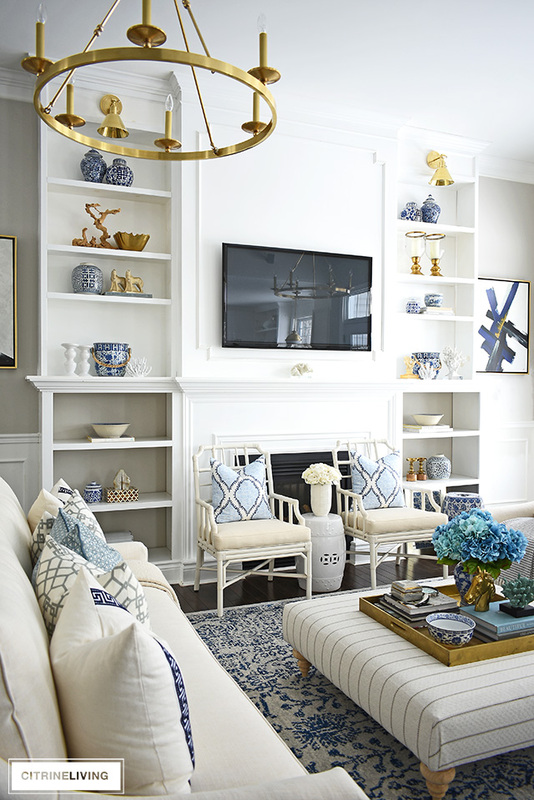 In my case, I think I fall somewhere in between when I approach my styling techniques for our living room bookshelves – they are no easy feat, trust me! They’re very large, the focal point of the room, and are also the full height of our space, which is eleven feet. I have to be very careful when I approach decorating these shelves, and make sure they don’t overwhelm our space with too much ‘visual clutter’. 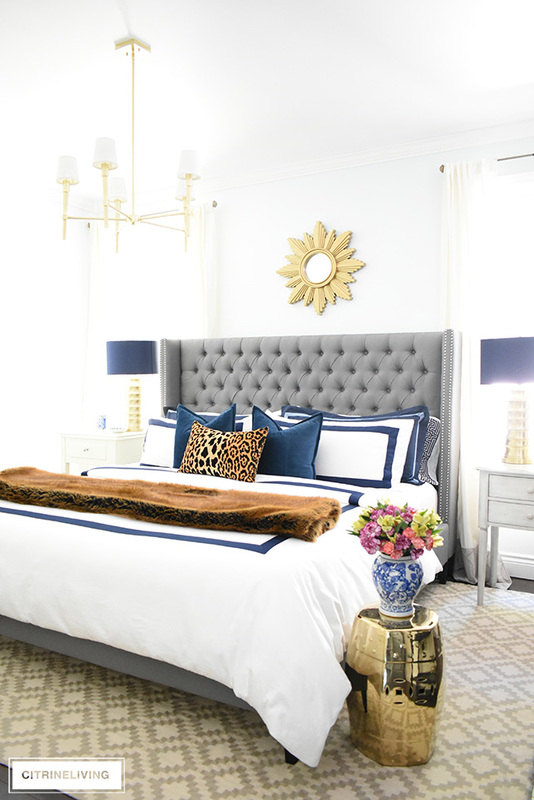 Hence, why I usually tend to keep the styling on the simpler side, and for that reason I may or may not break a few decorating and design rules in the process! 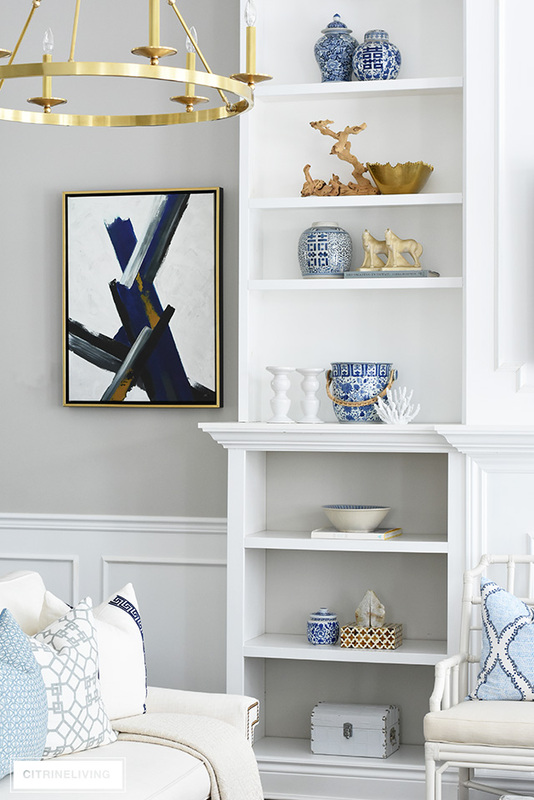 I have a decent size collection of blue and white pieces and although they are in continuous rotation on our bookshelves, I still aim to create something a little different each time I do a refresh. 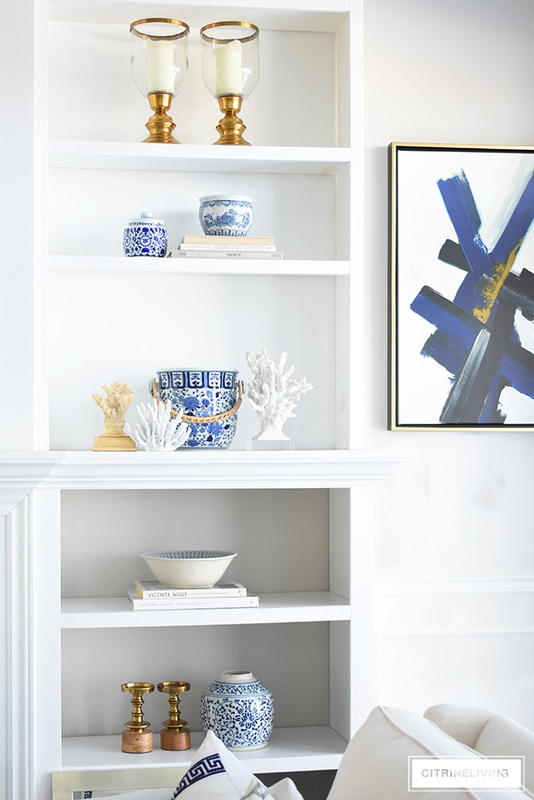 For my spring decorated shelves, it was very important to me to balance my chosen pieces with touches of gold or brass, some natural elements like wood, agate and coral, as well as creating somewhat of a symmetrical look and feel. Even though the two shelves on either side are not exactly the same, I wanted the overall look to feel that way, to create visual balance in our living room. This room’s design is also based on symmetry, so it was very important to me that the shelves be styled along the same design principles. Plus, I am a real sucker for any symmetrical space! If you look at the left hand side of our builtin shelving, and really break it down by color and texture (which is how I approached my decorating in this case), each shelf is styled either the same, or very similarly to it’s right-hand side counterpart, to create the symmetry I was after. Let’s have a closer look from the top shelf down. 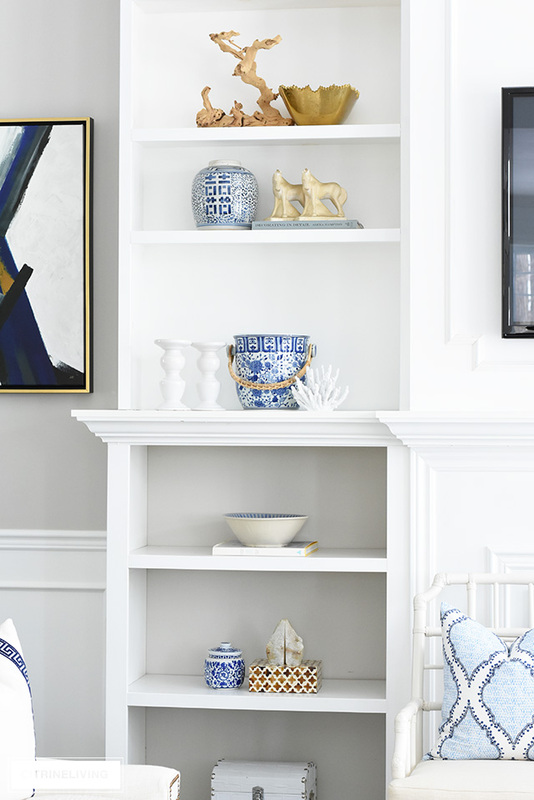 On the very top, I started with a pair of ginger jars, in two different heights – which is important to do sometimes when grouping items together, it creates a much more eye-pleasing display. Particularly if you have odd numbers of accessories. You want to try to create an ‘invisible triangle’ for your groupings, when you can. In other words, if you drew an outline of your grouping, it would make a triangular shape. Many people like to use odd numbers, versus even, or groups of three’s, which I also love to use, when I can. I’ve gone ahead and broken that design rule here, because I’m using a lot of even numbers versus odd. Most often, odd numbers work better, are more pleasing to look at, and it’s much easier to create a vignette (remember that triangle! ), or display with when you have three’s rather than a pair for example. In my case, because I didn’t want the shelves to be too full and busy, I ended up using many even numbers of items. That’s ok, don’t worry! There are no real ‘rules’ per se, but guidelines are always helpful! If using three’s and odd numbers gives you better and more pleasing bookshelves, then go for it! I love them too! But in this case, I purposely did not – again, simply because these shelves are so huge and make a very big statement in our room. I wanted them to also ‘breathe visually’ and not be too full of stuff. You can totally follow your gut if you prefer the way something looks as opposed to thinking you’re making a mistake by not doing what you think you have to. Look at the second shelf in both the above and below images – I even broke my own design rule on the right-hand side, with a pair of lanterns of the same height – no staggered heights (or invisible triangles) happening here! Plus, I really love pairs! What I did do, is balance the height on the left-hand side shelf with my driftwood sculpture, so the shelves are visually – you guessed it – balanced and symmetrical. 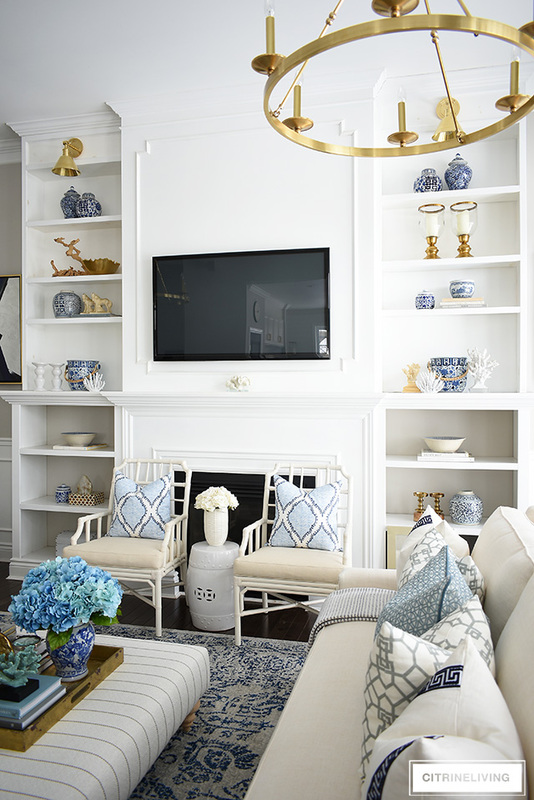 The same rule applies for each of my shelves – balance and symmetry was the ultimate goal here. Vases: Look for different sizes and shapes for varying heights. Different textures always add interest as well. Ginger Jars: I have so many differents kinds, the more the merrier! Bowls: Large ones work well stacked atop some books all on their own, and smaller ones work great to top off a decorative box. Hurricane Lanterns/Lanterns: I personally like larger-scale lanterns. They’re easier to decorate with and always make a strong statement. And I love them in pairs! Books: You can never have too many! Scour yard sales, second-hand stores, someone’s basement or attic! They make the best toppers for any display. I also love to collect coffee table design books. Candleholders: I personally like pairs, but I wouldn’t stop at buying a single gorgeous one to work into any vignette. I always gravitate toward ones with a sculptural quality. Small planters: Use them with our without plants! They act like a small bowl and are fabulous toppers, and always work with faux flowers pr greenery as well. Champaign/Ice Buckets: I love my blue and white pair! I use them all over our home for multiple purposes. They stand fabulous on their own, just as well. Coral/Agate/Natural Curiosities: Every room deserves a touch of nature. I am not particularly a plant person, so I always love to incorporate natural elements in other ways. Anything with a sculptural quality is a win-win, and curiosities always add interest. Framed Anything – Prints, Wallpaper, Sketches, etc. : I haven’t used any here, but have in the past…I think it’s time to think about it again! Decorative Boxes: I always love a good decorative box. Top them off with just about anything, or use them atop your favorite stack of books. A beautiful box goes a very long way. Spheres/Orbs: You don’t see any here right now, but I love using spheres and orbs just about anywhere – they top off any display beautifully. Interesting objects with meaning: My horse bookends are a perfect example – they were my grandmother’s and I have broken them several times but I’ll never part with them. They’re beautiful and add interest not only with their design, but their story. 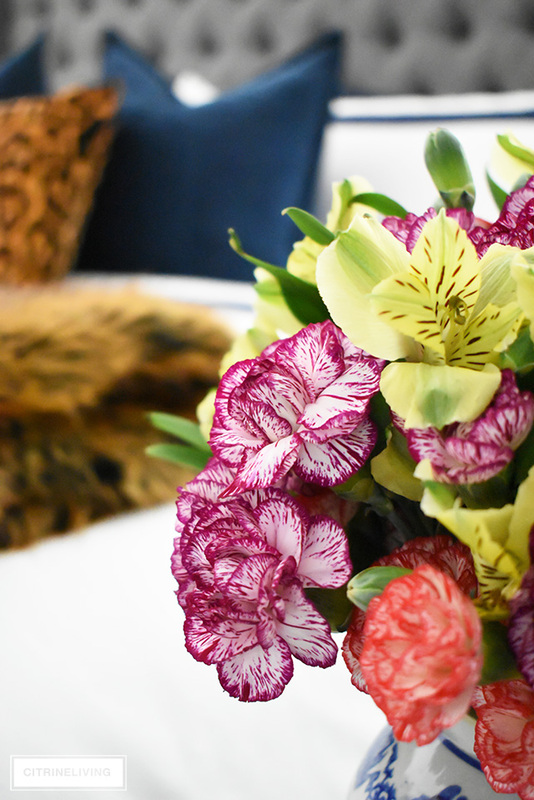 Flowers: Faux or real, they are always a winner! Here, one or two dominant colors are key, and then possibly a third color to support. 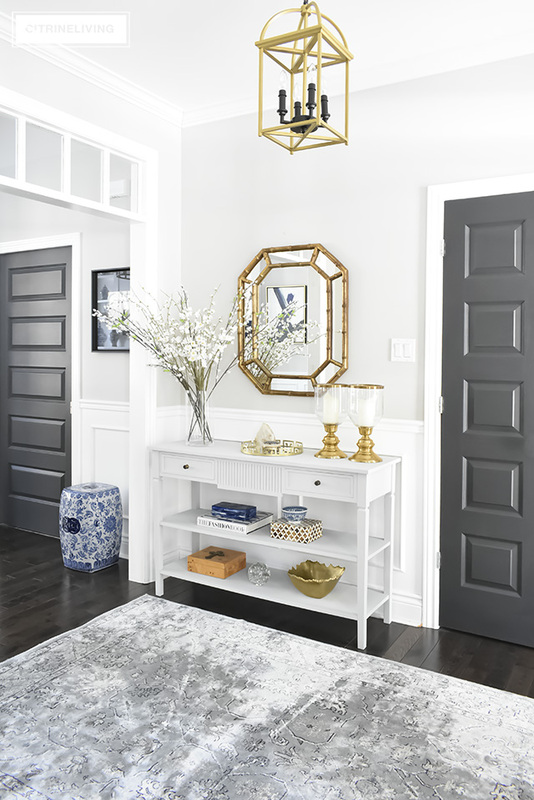 That doesn’t mean you can’t have hints of other colors on your shelves, just make sure to use them in smaller doses so they don’t compete with the rest of your accessories. If your theme is full on color that runs the gamut, then just remember to keep them visually balanced – always! Blue and brass (and natural tones) are my dominant colors here, with white acting as the third, supporting color in my theme. My selective color palette helps to unify the room. 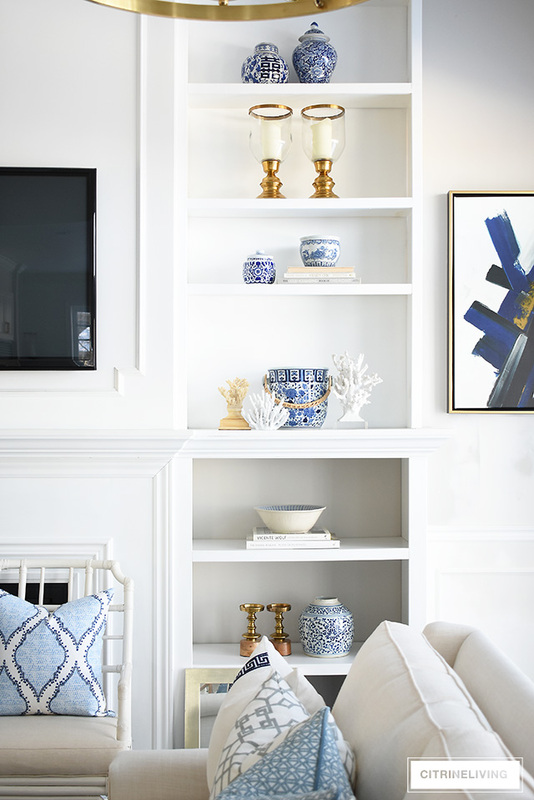 Remember – these shelves are huge and very dominant in our living room, and even though they are the focal point of the space, they also need to support all of the other elements. 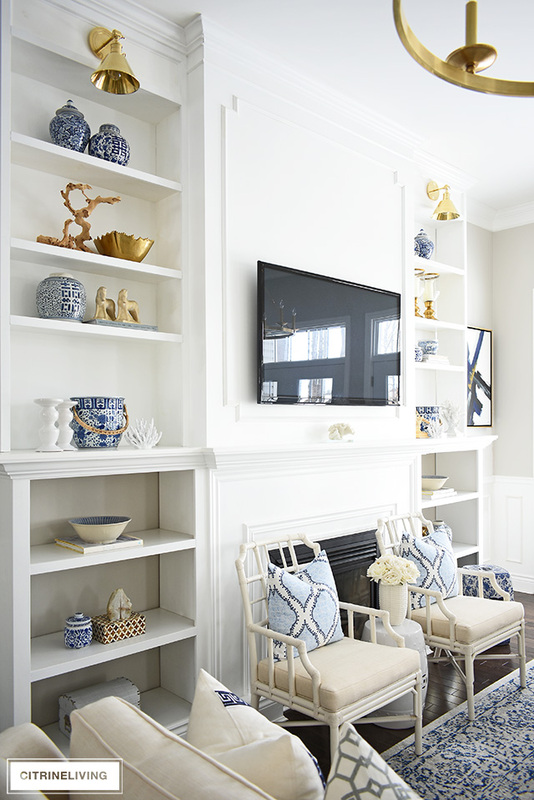 With my blue, brass (and natural) and white color palette in mind, I wanted our bookshelves to reiterate our home’s spring theme for a cohesive design in this room. 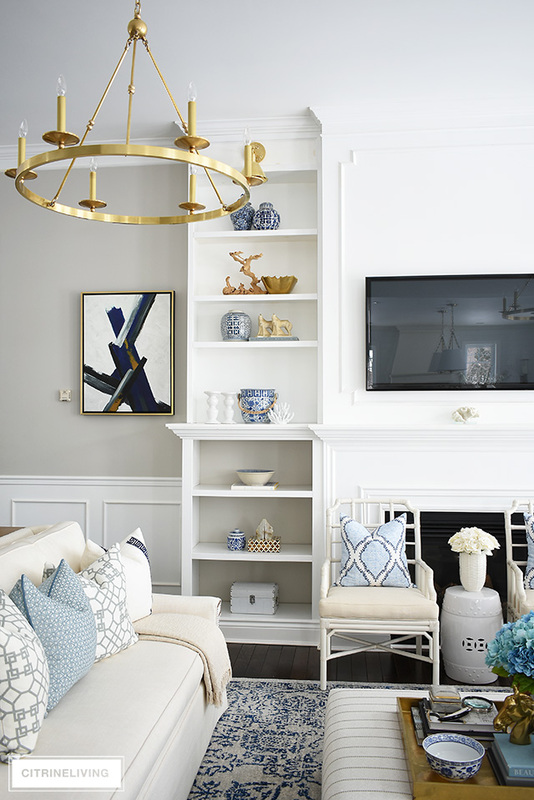 If you’re new to my blog, we have a lot of newness in this space – white sofas, chandeliers and wall sconces all help to lighten and brighten our living room (see the before here). Our bookshelves needed to be complementary to all of the new pieces in the space as well, and let them shine. You have such a lovely home! I love the changes you have made this past year. I am a real sucker for blue and white porcelains and have quite a collection myself. 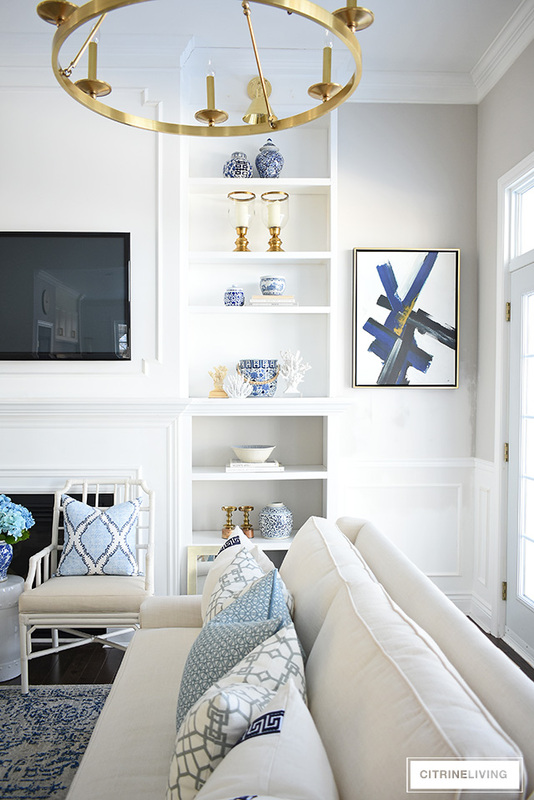 As I look at your bookcases and fireplace wall I wonder if your beautiful bookcase displays would have more impact if the backs of the shelves were painted say an indigo or a blue pulled from your rug? My eye first goes to the TV and then to the bookcases. 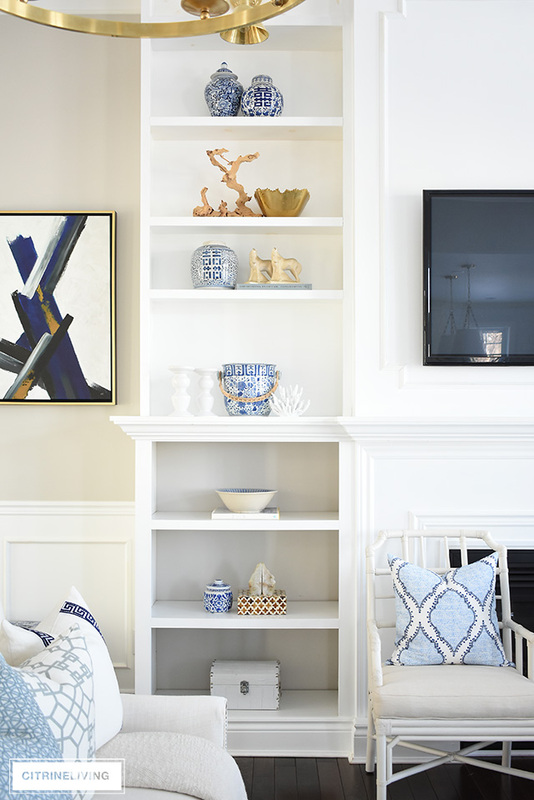 I have run into this situation with a number of my clients and the addition of the deeper color gives the weight that is needed to draw your eye immediately to the displays and not the TV. Thank you for sharing your lovely home with all of us. Judy, thank you very much! We have made many changes and it really does feel so nice to have everything a little bit lighter and brighter. But I do love that idea of painting the shelves inside! Maybe one day I’ll find the courage haha! I know, that darn TV…I’d love to cover it up! Thanks for your advice and than you for reading! Thank you very much, Joanna, I’m so happy you approve! I love it and might keep it the same for summer! How very beautiful! Calming and serene. I love your home and the way you decorate. I know you needed a change, but I loved your dark dining room and the painting from your mother. It will always be my favorite.